Show and Tell Meg: OpenSky: Melissa & Doug Trunki for $19! OpenSky: Melissa & Doug Trunki for $19! If you are in the market for a Trunki, you should check out this sale on OpenSky. OpenSky is a daily deal website that categorizes things by different celebrities who like them. You can 'follow' different contributors and then you will have access to the super discounted prices on items on their lists. 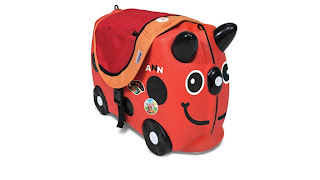 Today, Project Nursery has a Trunki listed and you can snag it for only $19 which is a phenomenal price considering these go for $40 anywhere else. I don't even have a kid and I'm contemplating one :) They are just so darn cute and functional to boot! If you are not a member of OpenSky: Go here to sign up! I recommend joining simply because they give out the most credits to their members out of any other deal site I am a member of - and believe me, I join a lot of them :) I get an email saying I have a $10 credit at least once per month, sometimes more often, and it is valid for a few days each time. So, check them out to see the other items they have for sale!